I have been waiting for this opportunity since the beginning of this academic year; the opportunity to use an inquiry in my lesson! I fell in love with using the inquiry maths prompts last year after using them for the first time. I have now used them several times with different classes and enjoy using them. 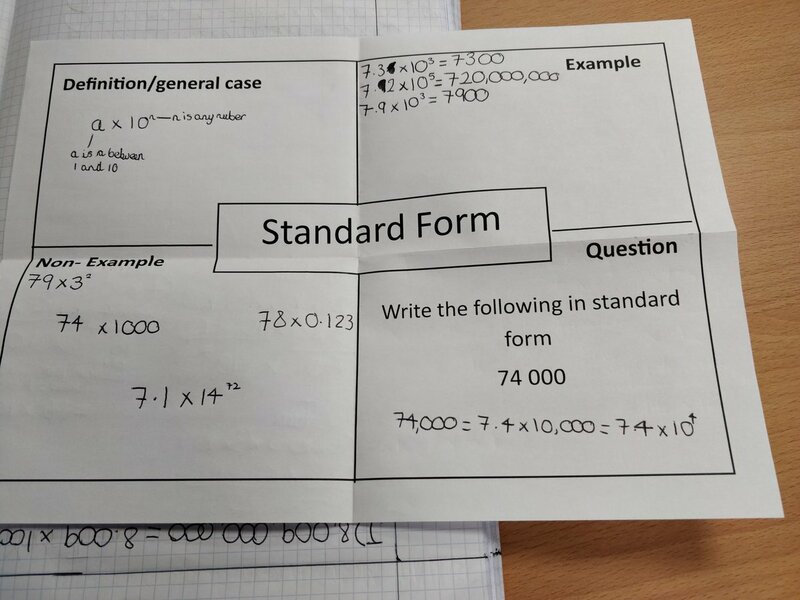 The value that the students get from these lessons is fantastic and I love that it makes them think for themselves and encourages them to ask questions. The inquiry I used this wek was ‘The Surface area of a cuboid can never be less than its volume’. This inquiry was used with my new year 7 class so it is their first time using inquiry with me. I am no longer nervous about using inquiry for the first time as I know that the students will gain something from the lesson and that I can structure it to help guide the students. I had already pre-empted that my students might need a refresher on surface area and volume and so I already had examples ready to go on my lesson slides. I went through an example of volume and an example of surface area and made the students copy this into their books. From there, I put the prompt back on the board and told the students that they needed to investigate. 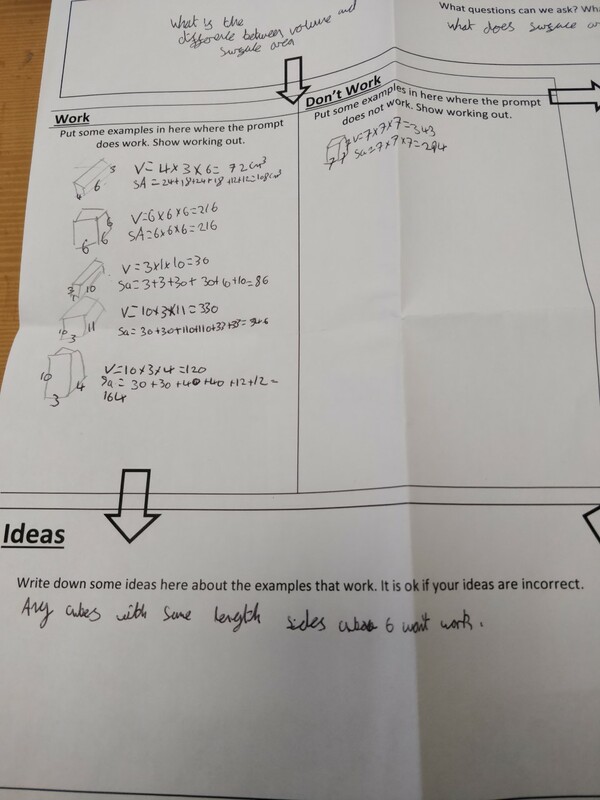 I have previously used inquiry flowcharts (again from the website) to help students form their inquiry and these have been succesful and so I used them again this lesson. I made it clear that it didn’t matter if they did not have example of things that work or do not work as this may just be part of the inquiry. The students worked in pairs and were given time to start drawing cuboids and finding their SA and volumes. One of the questions that one of my students asked was brilliant ‘Miss, you know how a few lessons ago you said that a square is a special type of rectangle, does that mean that a cube is a special type of cuboid? Can we use cubes?’. This question shows that my student was making a connection with prior learning. It also showed that they were thinking about properties of 2D and 3D shapes and that they truly were inquiring about the prompt. Some of my students got excited when they realised this was true and started calling me over during the lesson when they were using the cube that has lenghts of 6cm. 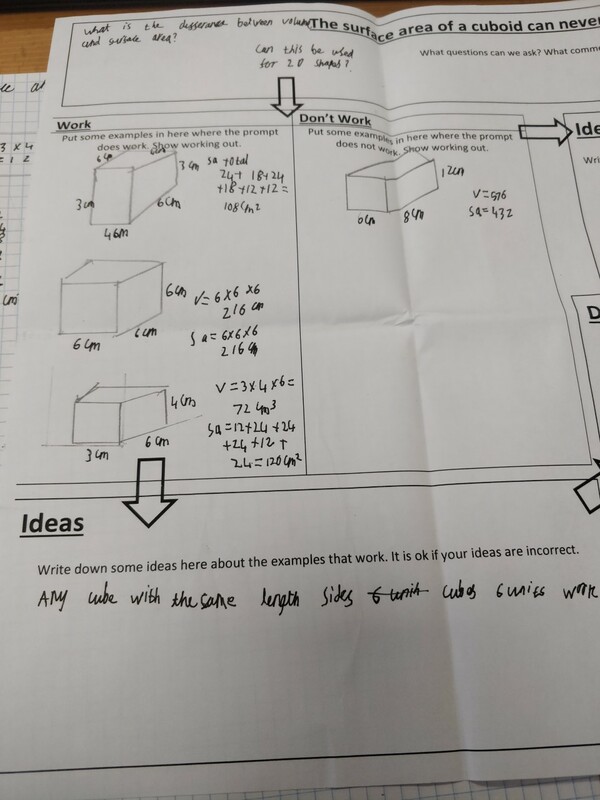 A cube of 6cm produces the same SA and volume and the students were asking whether this was an example for or against the prompt and so we started to disucss the wording ‘it can never be less’. Is the SA less than the volume? No, it is the same. Correct, therefore, does it show that the prompt it wrong? No, because they wer equal. It’s great to be able to have these conversations and to really get to the root of mathematical language such as less than and the difference between statements such as less than and less than and equal to. Towards the end of the lesson I asked the class about what examples they had found and what were they thinking. One of my students put their hand up to say they hadn’t yet found an example that was against the prompt but they were just about to use a cube of 1cm lengths. This gave me an opportunity in front of the class to go through this thought and ask the students what the SA and volume was. It’s also great to show the students that we can have thoughts, try them out and them not always work. This would be how mathematicians would discover things. Another excellent part of inquiry maths is the encouragement for students to make links and spot patterns. 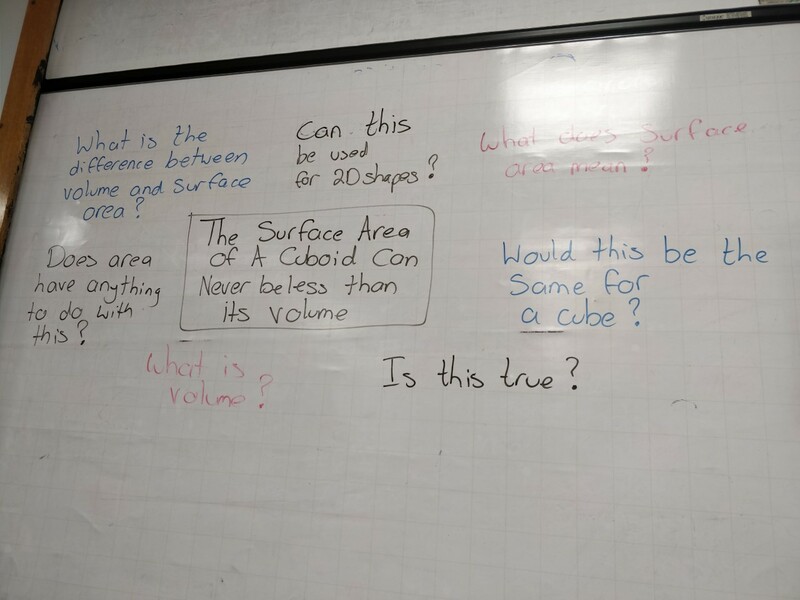 As you can clearly see from this bottom picture, the student has started to conjecture that a cube that has length above 6cm will always produce a smaller SA than the volume. This is now something that this student can investigate further. This lesson was a great way to once again expose my students to thinking skills and starting to make links and conjecture. The students all appeared to be engaged and at the same time were practising the skills of calculating the SA and volume of cubes and cuboids. If you have not yet used an inquiry lesson, I do recommend that you give one a go. 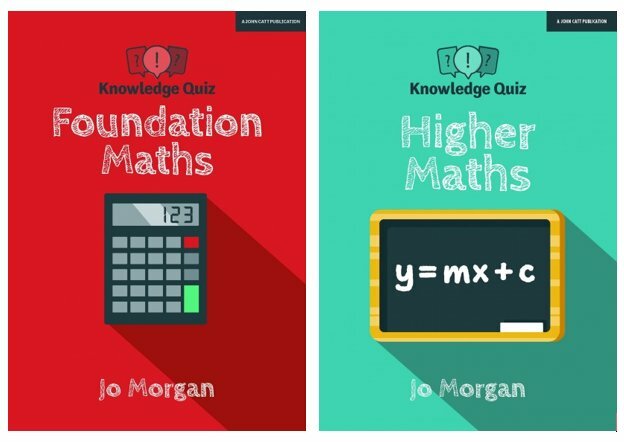 Head to http://www.inquirymaths.co.uk/ and look through the prompts and read the musings of other teachers. I am so pleased that I decided to given inquiry a go and now I try my best to incoorporate an inquiry lesson into my teaching when I can.